The 4th Annual ADJ Fun Day will be Saturday June 13th! The date has been pushed back a few weeks in hopes of warmer weather! 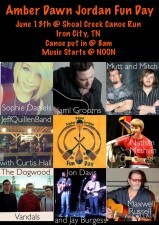 The details of the canoe run, live music, and entertainment will be announced soon!! Proceeds will be donated to local Charities, Fire Departments, and Scholarships! !